Growing or sustaining international student enrollment requires enhancing the student experience and supporting their success, according to the recent article titled “12 Strategies for Building a Capacity for International Graduate Student Career Success.” The article co-authored by Rahul Choudaha and Di Hu was published in the Spring 2017 issue of NAGAP Perspectives (Click here to read full article). With more than 2,000 members, NAGAP, The Association for Graduate Enrollment Management exclusively focuses on professionals working in the graduate enrollment management environment. The graduate enrollment at many American graduate schools are stagnating. In contrast, the total international enrollment in graduate programs increased by 6.2% in the same period. Broadly, most international graduate students’ decision to study abroad is influenced by an interplay of financial investment and potential career opportunities. This is evident from the importance of funding opportunities like scholarships and assistantships in students’ search criteria. Likewise, it is well established that the prospects of finding job and internships are very critical in student’s decision-making process. Many of them come with the expectation to receive more support in finding career opportunities. They assume that their high investment in education and the institutional reputation should entitle them to an experiential opportunity. However, many students lack the mindset and skillset to navigate a culturally different, more competitive job and internship market. 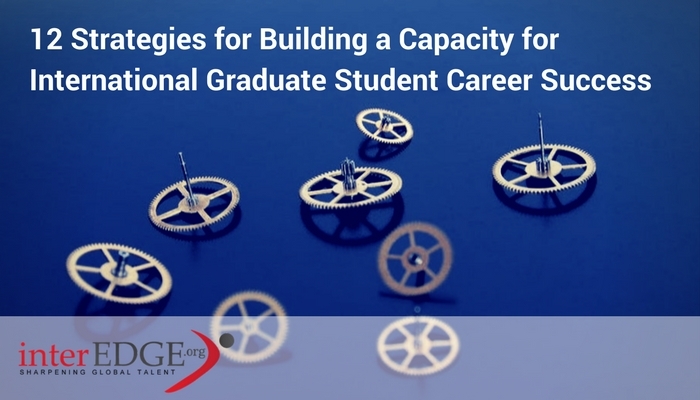 However, the decentralized structure of graduate schools and career services can make it even more complex to bring synergy and efficiency in the programming and resources for supporting international students. Here are 12 strategies to start building a capacity for international graduate student success. Focus on international student experience: Recruiting and enrolling international students is becoming more competitive. GEM professionals should leverage positive international student experiences and success stories to build brand recognition among prospective students. Align faculty and staff efforts: For many faculty and staff members, working with a culturally diverse student community poses challenges which are beyond language skills. Bring together campus in aligning efforts for effectively working with diverse segments of international students. Share good practices across campus: One way of overcoming the dissipated energy due to decentralized nature of the graduate schools is to collaborate across schools on core programming related to international student experience and career development. Partner to make relevant resources available: GEM professionals have limited time, expertise and resources to allocate towards career advancement. However, they can catalyze the process by partnering with internal and external stakeholders to make resources available in a flexible and economic manner. Expand career pathways: Visa and immigration constraints are a reality. Raise students’ awareness, as early as possible, of alternative career pathways in terms of locations, industries and occupations and help them understand the bigger picture about career and life planning. Enable students with employer search strategies: Many international students struggle with finding employers who will be willing to sponsor future visas. This requires equipping students will information to help locate and educate potential employers about offering experiential opportunities to international students. Educate students about cultural differences: Many international students underestimate the importance of cultural differences in navigating career opportunities in the U.S. They are often unprepared with the soft skills like professional networking. Build students’ soft skills: Knowing about the cultural differences is only part of the story, building a skillset to navigate the differences is another aspect. Many institutions do not have the internal capacity to support skill development. Recognize the diversity of international students: Often international students are placed in one monolithic block. It is critical to understand the different international student segments in terms of their motivations, resources, preparedness and cultural mindsets. Leverage pre-departure and on-campus orientation: While institutions have some form of orientation for international students, it often focuses on immigration and visa compliance. A basic introduction to cultural differences from the perspective of career planning and job search in the U.S. will help students start with the right foundation. Explore reusable and flexible online resources: Providing online resources and programs offers a higher level of personalization to a diverse student population. It can also accommodate the schedule conflicts of international students in different programs. Engage current international students and alumni: Despite being a well-known strategy, it is often underutilized. Formalizing and co-creating a mentoring program not only fosters an active student community, but also offers support to students in a cost-effective manner. As international student enrollment becomes more integral to sustainability and growth of American graduate schools, more investments, efforts and strategies must be allocated to support international student success throughout their education lifecycle. It is critical that GEM professionals take the lead in strengthening collaboration across decentralized silos of graduate schools and supporting the career needs and expectations of international students as it directly correlates with the recruitment and admissions outcomes. Previous International Students: Are you Dreading Class Participation?